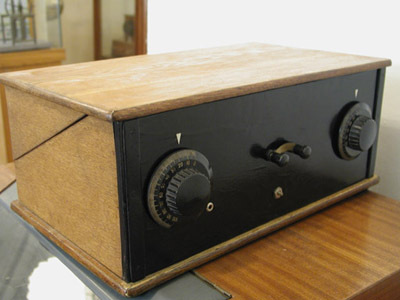 Here we have a fascinating and very early theremin, apparently built by the inventor, or given its extraordinarily clean appearance, possibly a faithful reproduction using era-correct parts and construction techniques. This is truly an example of Bob Moog's comment When you look inside one of Theremin's original instruments, there's nothing there. It's all smarts. This theremin would likely date from approximately 1925 or 1926, based on the audio output transformer's shell style and possible use of straight-line tuning capacitors for more linear adjustment (improved photo angle needed to verify). 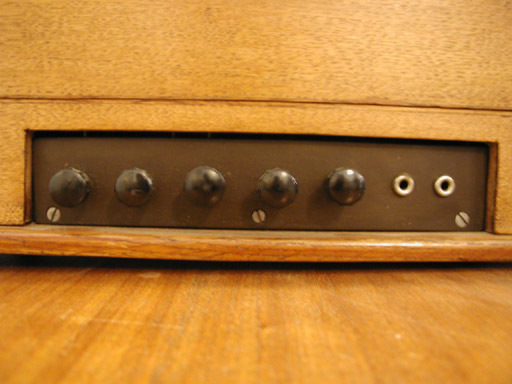 If not for these details this theremin could be placed a year or two earlier. 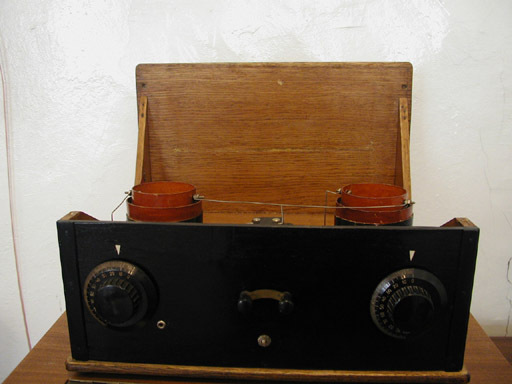 The circuit is straightforward in the extreme, and at first glance could be mistaken for a simple circa 1923–24 era regenerative radio receiver. Closer inspection reveals the requisite pair of pitch oscillators (in this case, both are controllable from the front panel). The pitch antenna was likely a simple wire rod attached to the binding post on the right side wall of the cabinet. 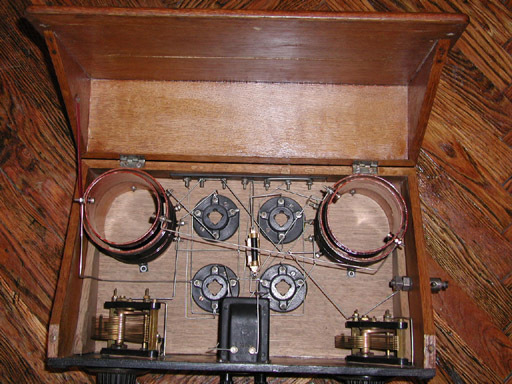 Typical of the era, simple triode tubes are employed throughout, possibly a near-equivalent to the American dry-cell type RCA UV-199. A conventional grid-leak detector appears to serve the purpose of audio detection. Battery posts on the rear of the cabinet provide means of getting filament and plate voltages to the tubes. A pair of terminals on the front provide audio for an external loudspeaker. 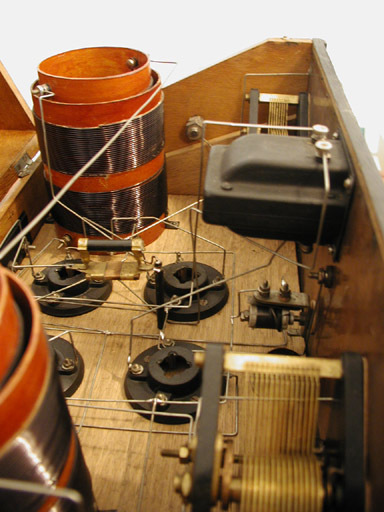 Based on the large wire gauge and number of windings on the coils, combined with the relatively low capacitance of the adjustable capacitors, this theremin would likely have operated at higher oscillator frequencies and had a narrower pitch range. The pair of pin jacks on the rear terminal strip may be for an articulation control, as this appears to be a pitch only instrument; i.e., no proximity control of volume. Despite these shortcomings, this theremin remains an invaluable example of an early state of development of theremin technology.